(Los Angeles, California – March 6, 2013) Los Angeles Mayor Antonio R. Villaraigosa was joined today by Los Angeles World Airports (LAWA) and Singapore Airlines executives to unveil the north concourse and three gates of the New Tom Bradley International Terminal (New TBIT) at Los Angeles International Airport (LAX). The gates are the first of 18 to be built at New TBIT. 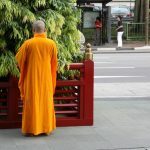 Nine of the 18 gates – including two of the three unveiled today — can accommodate the larger, new-generation aircraft, such as the Boeing 747-8 Intercontinental and Airbus A-380 super jumbo jets. All 18 gates will use state-of-the-art, laser-based, visual guidance docking systems. Computerized passenger boarding bridges automate the operations between the terminal and aircraft doors. LAWA is installing three passenger boarding bridges at all of the new A-380-compatible gates, which will greatly improve the amount of time to load and unload an aircraft. At the boarding gates, electrical outlets and USB ports for charging personal electronic equipment, such as cell phones, tablets, and laptops, are installed at each bank of seats. Free Wi-Fi service – already accessible throughout LAX terminals — also is available. More than 30 airlines operate at the Bradley Terminal, using more than 20 different types of aircraft. All airline gate personnel have to be trained and certified to use the new passenger boarding bridges with their particular types of aircraft. Demonstrating how the new gates operate to news media covering the unveiling event, Singapore Airlines’ daily flight SQ 12 from Singapore (on A-380 aircraft) arrived and docked at Gate 134, the northern-most gate of the new terminal. In 2012, LAX served nearly 63.7 million passengers, of which nearly 17.2 million (or 27 percent) were international travelers. 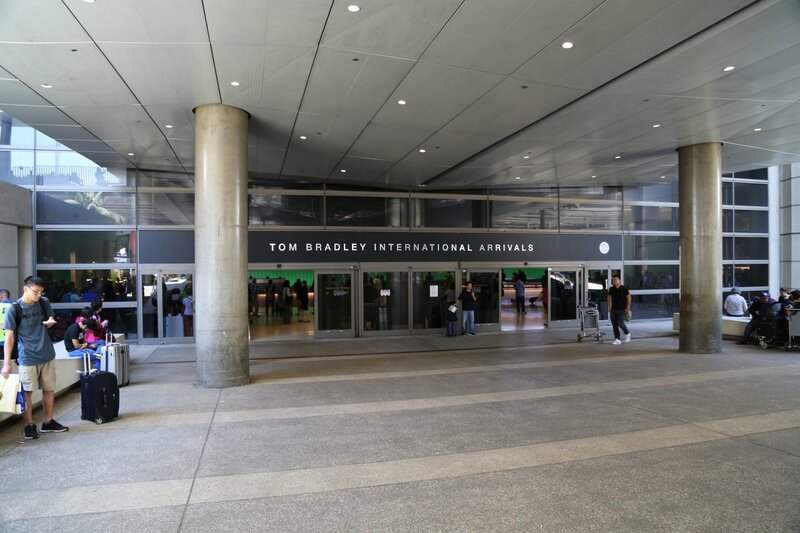 The Tom Bradley International Terminal served 8.6 million (or 50 percent) of LAX’s total international passengers. Gate 134 became operational last September, and Gates 130 and 132 became operational last week. Schedules vary, but on average, 12 to 16 arrivals and departures currently use these new gates each day. Currently five international airlines (Air France, China Southern, Korean, Qantas and Singapore) provide daily A-380 service and Lufthansa German Airlines provides Boeing 747-8 daily service. More airlines are scheduled to bring service on the larger, new-generation aircraft, making LAX the U.S. West Coast’s leading airport with such service. Completion of the three gates and the interior of the north concourse represent a major milestone toward completion of the $1.5-billion New TBIT Project, and the opening of the project’s first phase this summer. Phase 1 includes a Great Hall with 150,000 square feet of premium dining and shopping, airline lounges, and other passenger amenities including a play area for children. It also includes nine new boarding gates on the west side of the terminal. Phase 2, which includes the gates on the east side of the terminal and expanded areas for federal passenger security screening and customs and immigration processing, is scheduled to be completed in 2014. 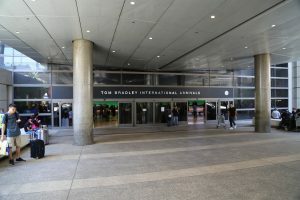 The New Tom Bradley International Terminal Project is the largest public works project in the City’s history and is creating 4,000 construction-related jobs during its four-year project schedule and is expected to create thousands of permanent jobs upon completion. Airport officials estimate that 90 percent of the construction workforce comes from the Southern California region, and nearly 40 percent of the workers are residents of the City of Los Angeles and other communities near LAX. 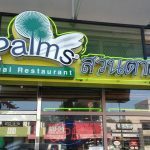 Funding for the project comes from LAX’s operating revenues, fees from airlines, passenger facility charges, and airport revenue bond proceeds. No money from the City’s general fund is being used. LAX is the sixth busiest airport in the world and third in the United States, offering 680 daily flights to 96 domestic cities and 930 weekly nonstop flights to 59 cities in 30 countries on 63 commercial air carriers. It ranks 13th in the world in air cargo tonnage processed. In 2012, LAX served nearly 63.7 million passengers, processed over 1.9 million tons of air cargo valued at nearly $89.6 billion, and handled 605,480 aircraft operations (landings and takeoffs). An economic impact study in 2011 reported that operations at LAX generated 294,400 jobs in Los Angeles County with labor income of $13.6 billion and economic output of more than $39.7 billion. This activity added $2.5 billion to local and state revenues. LAX is part of a system of three Southern California airports – along with LA/Ontario International Airport and Van Nuys general aviation – that are owned and operated by Los Angeles World Airports, a proprietary department of the City of Los Angeles that receives no funding from the City’s general fund. For more information about LAX, please visit www.lawa.aero/lax or follow us on Twitter @LAX_Official, on Facebook at www.facebook.com/LAInternationalAirport, and on YouTube at www.YouTube.com/laxairport. 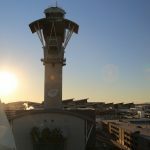 For Information about the LAX Modernization Program, please visit www.la-next.com.